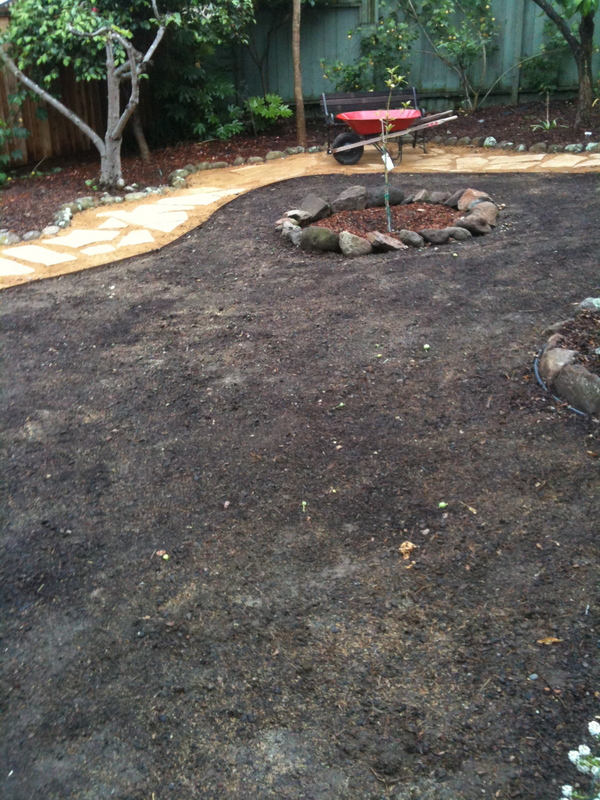 Yes, nearly two years after I first asked the interweb what we should do with the lawn, we finally did something! Under pressure from a looming wedding brunch, I finally got my act together and chose the EarthTurf grass seed mix for our lawn. EarthTurf is apparently made by Hobbs & Hopkins in Portland—or at least it shares a physical address and is sold through the same site as their seed—and as far as I can tell is roughly the same as the Rough & Ready mix that H&H sells, so it may just be the same mix rebranded. It’s similar to the Fleur de Lawn mix that everyone overwhelmingly picked on my little poll a couple years back, but without the flowers. (I had read stories of Fleur de Lawn that noted that the flowering plants tended to attract slugs, which are a HUGE issue in our yard, so I decided we didn’t need any more of that, as nice as the flowers would have been!) 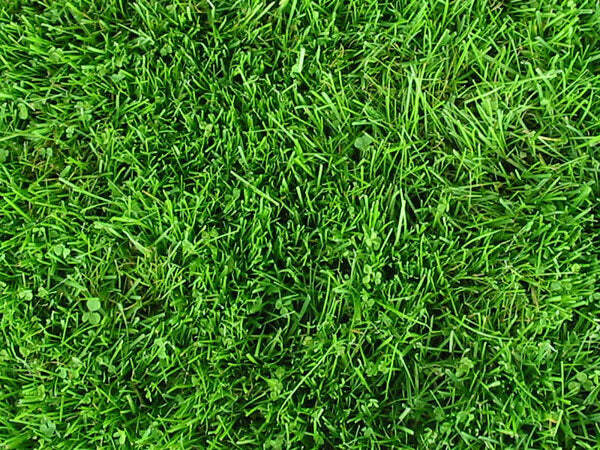 Instead, EarthTurf mixes white microclover with creeping red fescue, hard fescue, sheep’s fescue, chewings fescue, dwarf perennial ryegrass and smooth stalked meadow grass, all drought-tolerant types of turfgrass. In theory, when the lawn is mature it will need little water and the clover will help fix nitrogen so that it self-fertilizes. The few reports I’d read of people who’ve grown it also noted that it was especially resilient to dogs. We’ll see! We’ve gone back and forth on whether to put grass back into the center of the yard over the past two years, but in the end, we decided it was important to have some turf for the dog to run on. 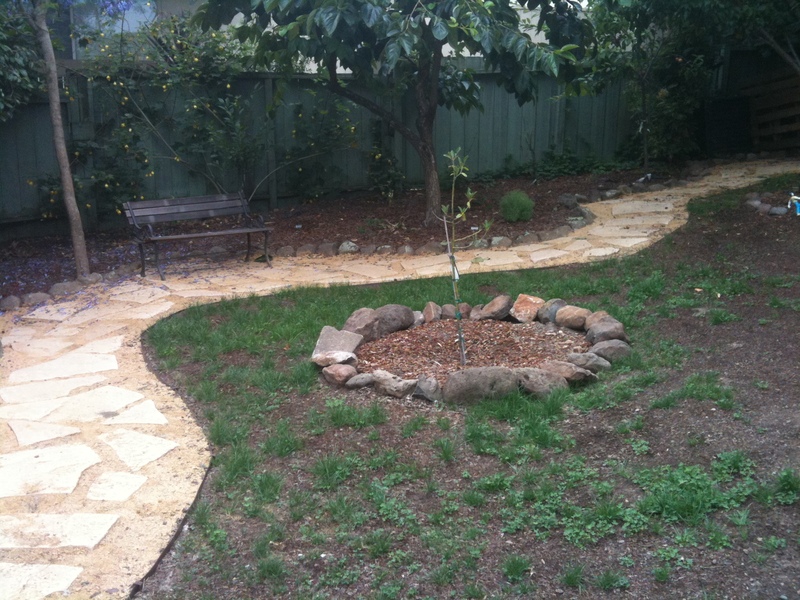 We did ring the grassy area with a three-foot path all the way around, though, and encircled the baby avocado tree with rocks to set it aside, so we have far less grass than we did to start with. Still, it’s been slow-going. Growing grass from seed turns out to be hard and somewhat unfulfilling work. I like the EarthTurf mix a lot where it’s come up, but seeding a lawn has turned out to be far more difficult than I imagined. 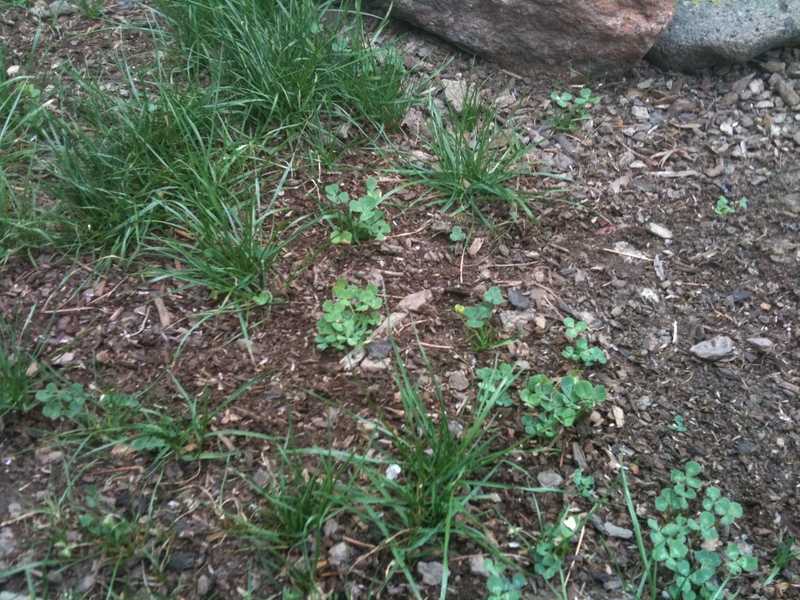 In addition, while it’s easy to tell mature microclover and oxalis apart, it’s not so simple when they’re seedlings, and we might have had better luck exterminating the oxalis had we used sod instead. If I had it to do over, I think I’d just get the sod and deal with having a less-than-ideal mix of grass types. By the time we seed and re-seed to fill in the bald spots, we’ll probably have spent about the same amount, and sod would have been much faster! 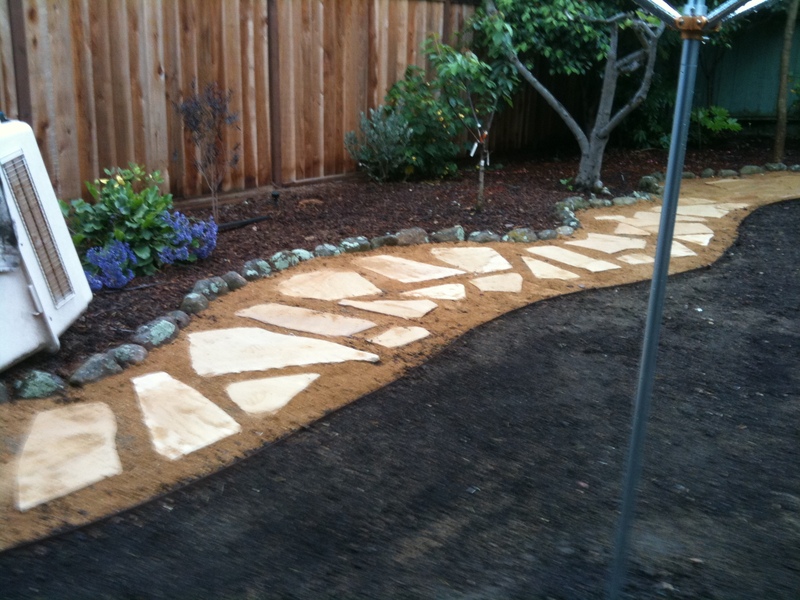 Update, 04/02/2013: Many months ago, someone asked what software I used to create the plan for our yard. 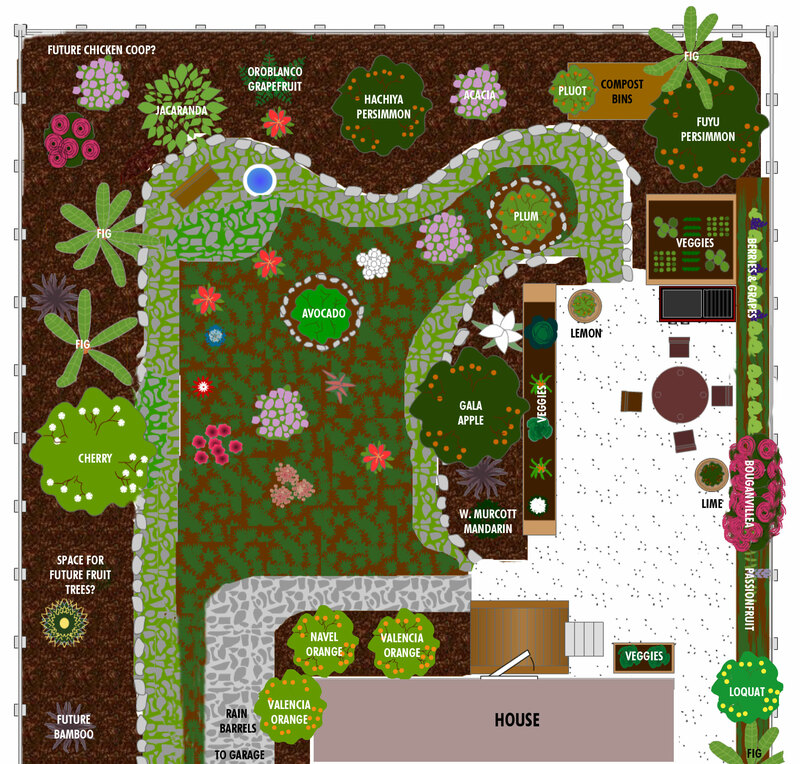 It was a tool called Garden Planner by Artifact Interactive. I used an older version for Mac, but they now have an online version that looks pretty handy too. It’s free to try and relatively inexpensive to buy (it’s good to support small software developers–plus the guy who created it has a very cute baby! ), and very easy to use. Okay, so temps just below freezing aren’t exactly considered a “deep freeze” anywhere else in the country. But around here, where we just planted all our winter seedlings and the citrus harvest is about to start, the frozen soil was a bit of a shocker, and the snow-covered hills caught just about everyone by surprise. Once I dug all my warm wool clothes out of storage, I remembered that once upon a time I used to know all about winter. However, my New England know-how never covered topics like what to do if the oranges on your tree are frozen solid or your December lettuce starts are wilting, so I had to hit the interweb to figure out what on earth you’re supposed to do when California freezes over. How can I keep my garden from being damaged by the frost? 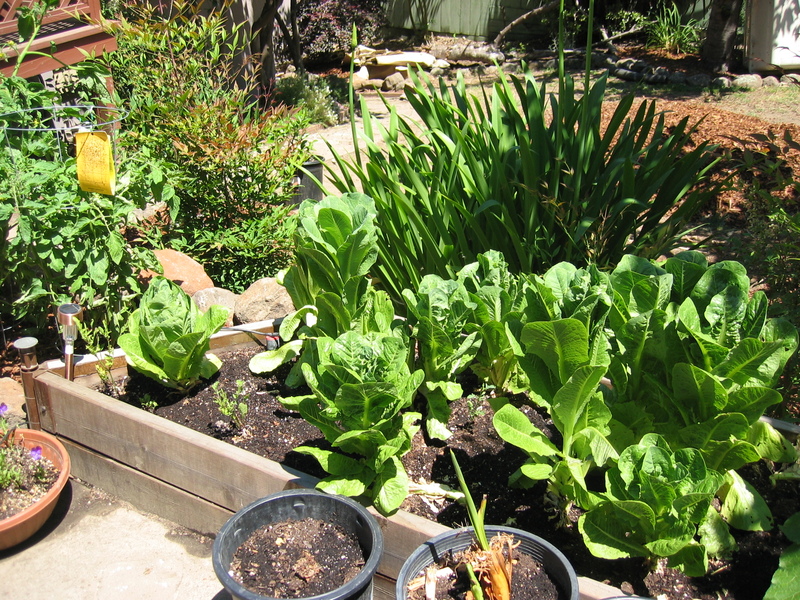 Water your plants, especially veggie starts, before the frost. If there’s a frost in the forecast, water your plants well and make sure the soil is moist. Spray the leaves with water, too. 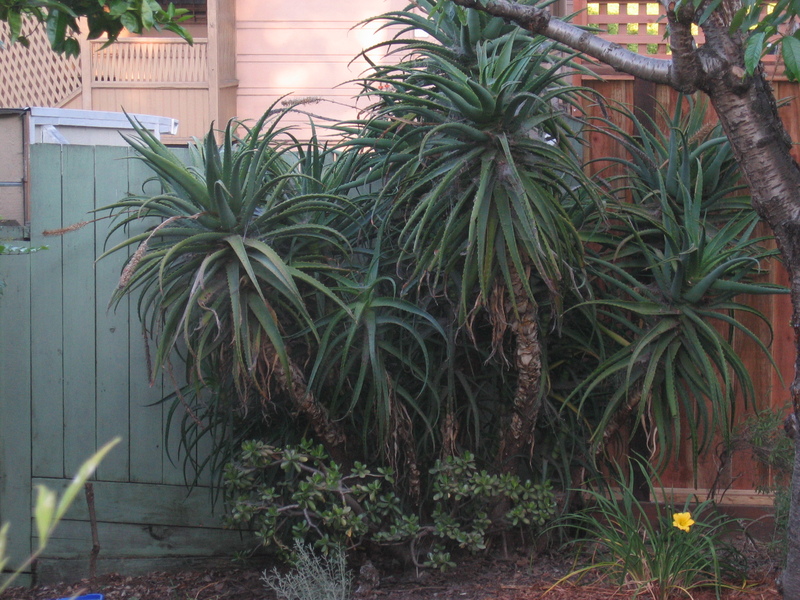 Don’t water them after the frost, though—just let them “defrost” on their own. Protect plants physically. In places where temperatures are regularly below freezing, people build frames and other devices to warm plants up. But around here, a simple covering is more than sufficient, since the freeze isn’t likely to last too long (I hope!) Blankets, newspaper, cardboard boxes, and milk cartons all work well. Try not to have the covering in direct contact with the plants—it should be more like a little tent of warm(er) air around the plant. How do I know if my plants were damaged by the frost? First and foremost, wait it out till warmer weather returns. Then you’ll be able to assess the signs. On citrus, damaged fruit will get swollen and puffy and the rind will separate. 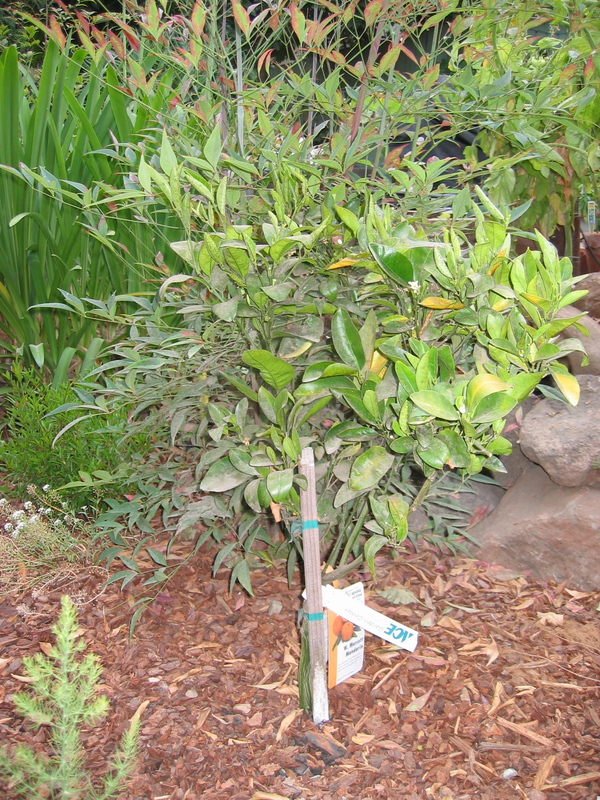 Damaged leaves may get brown spots. Don’t start pruning off any damaged wood till the spring, though—the tree may surprise you! On vegetables, frost damage isn’t subtle. The plants will wilt, look like they’re water logged, and then turn brown and die. There’s not too much you can do once the damage is done, though, so again—just wait and see. Generally, the hearty winter vegetables should hold their own in this (relatively!) mild cold, but if you have lots of lettuce starts in like we do, you may lose some of them. Black ice = bad. And there’s been some in various parts of the Bay this week. First, know that you can’t always see black ice on the road. If you hit it, you’ll feel it. Don’t brake quickly. Definitely don’t accelerate! Just ease onto the brake slowly and try to use the steering wheel to control the car, rather than the brakes or the gas. If you start to skid, don’t panic—just turn the wheel into the skid to regain control of the car. And leave lots of space between the car in front of you, just in case you do hit a patch of ice. Heat = good. This is the part where the East Coasters’ and Midwesterners’ eyes start to bug out, but there are still a decent number of houses in the Bay Area that don’t have heat, since it’s not needed most of the year. But it’s obviously a good idea to have some heat flowing right now, especially in areas where, say, pets are sleeping that may not be heated normally. Also, frozen pipes are not fun. I don’t think it will get cold enough for long enough in Oakland for this to be an issue, but Contra Costa County’s already under a frozen pipe alert. You can insulate outdoor pipes somewhat by wrapping them in rags or newspaper or the pipe insulation stuff they (hopefully?) sell at local hardware stores. On the off chance they do freeze, you can run water to try to get them moving again (assuming you’ve got at least a trickle coming through—but around here you probably do! ), or use an iron or hair dryer on low to warm them up a bit. Warm winter food = the best. Hot chocolate! Steel cut oats! Cream of wheat! Root vegetable pot pie! These are a few of my favorite things…and I eat them far too infrequently in sunny California. Perfect winter snow food—yay! Anyway. While we Californians have fun with our measly little snow piles, our storm is apparently headed east with a fury (or maybe a flurry?) As it gets past the Rockies, it should drop some real snow. Have fun! You say tomato, I say….fusarium wilt? Tomatoes! Clockwise from top: Glacier, Yellow Brandywine, Carmello, and a rather sad looking Taxi. The Paul Robeson died of unknown causes early in the season, and I never did figure out if it was due to disease or to the fact that the Labradane tried to dig it up the weekend after we planted it. The others put on a good show, though—we didn’t have a huge number of tomatoes, but definitely more than last summer (and with pretty mild temps to boot). So it’s back to the pots for the tomatoes next year—and I need to think of another good sun-lovin’ vegetable to plant in the big new planter with prime southern exposure instead. (Eggplants are too closely related to tomatoes, sadly, as are peppers—but squash may be an option.) For right now, we have fava bean cover crop planted there to try to build the soil up a bit. In other garden news, most of our winter crops are planted now—although the carrots and parsnips hit an unfortunate glitch when a big hole appeared in that bed. I filled it in, and the next day it reappeared—and the Labradane showed up in the kitchen smelling like fresh soil. At first we thought he’d been digging in there trying to get to a critter. But then a few days later, D. came out to find him curled up in the garden, enjoying the warm little nest he’d made for himself. Time to get a garden fence, I guess! No, that’s not a directive to Mayor Dellums (though if he’d like to take it as one, I have no issue with that!) It’s that other kind of lead. After a great tip from a reader (thanks, Len!) 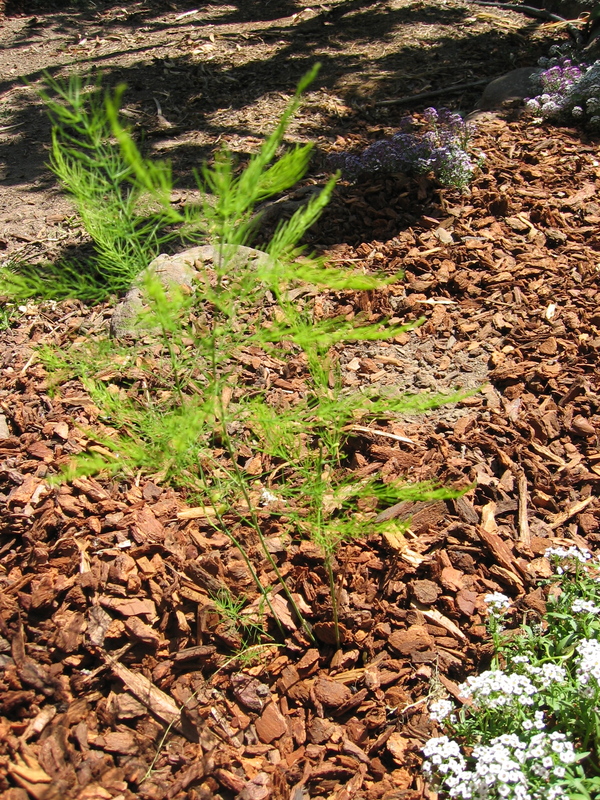 I recently called up the Alameda County Lead Poisoning Prevention Program (ACLPPP) to see what they could tell me about lead testing and lead safety, especially in soil. First, I have to say—these guys are rock stars! They called back promptly and had all sorts of information to share. A couple of days later, I received a complete lead test kit in the mail, with detailed instructions on how to test my soil, paint, and dust. I picked out nine areas—five sections of the backyard, two painted areas, and two dusty windowsills—and sent off the samples to be tested. (For FREE!) Just a few days later, along came the results in an emailed PDF. First, the bad news: the paint on the woodwork and the dust in the window sills have a whole lotta lead. We pretty much assumed as much—in a hundred-year-old house, it would be unusual for glossy trim paint not to have lead in it—but now that we know for sure, I’m having to rethink my strip-the-woodwork project. Lead, like asbestos and other icky airborne things, is not especially dangerous if it’s adhering properly to the painted surface (and you’re not licking it), but if it starts to flake off or chip and create paint flakes or dust that can be inhaled or eaten by small children or pets, it’s a bad scene. And you’re not supposed to remove high lead paint with a silent paint stripper (which was my plan), and I really don’t want to mess with the toxic chemical agents that can remove it safely. But happily, there was good news too. Specifically, the paint and plaster in our kitchen do not have lead in them to speak of—and that’s very good news, since someday soon we’re hoping to tackle the kitchen renovation, and it will be infinitely easier to attack the woodwork and wall demolition if we aren’t simultaneously worrying about lead abatement and controlling lead dust. And, perhaps even more importantly, our soil—all of it!—passed with flying colors, with everything testing on the very low end of the “lead safe” category (150-500 ppm). 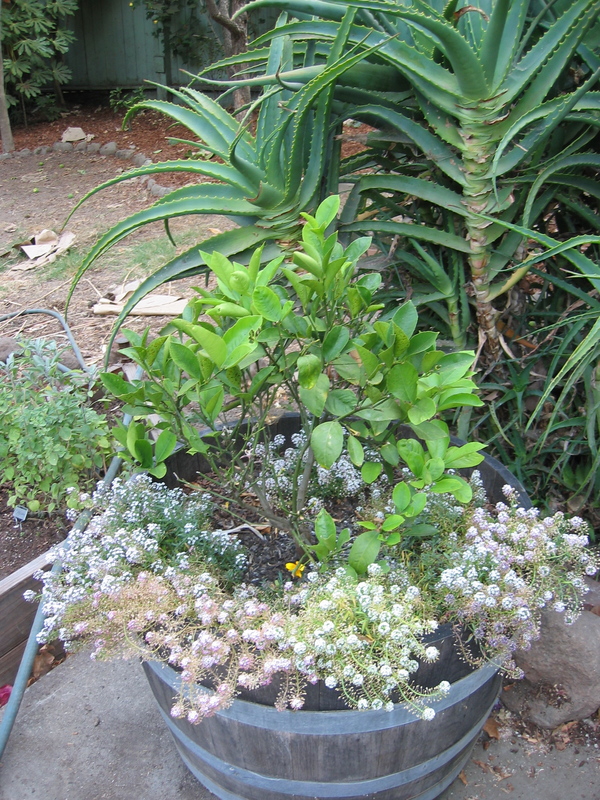 (In fact, the lead levels were barely higher in the soil from the ground than in the potting soil from the nursery that I threw in as a control. That may say more about the nursery soil than about our soil, but there ya go….) This is especially good news because it means we can begin to plant veggies in other areas of the yard, and we also don’t have to worry about trying to make the yard lead-safe (which would be a frustratingly painful process, since you basically have to dig everything out and replace the soil). So that was very welcome news. …and what to do about it! Based on this news, I’ll be repainting the woodwork in the dining room with a safe high-gloss paint to seal all that badness inside—and, of course, leaving a note for future owners that stripping the woodwork is probably not the bestest project to take on! (This is probably not the end of the world, since I’ve recently discovered that past owners of our house were—how shall I put it—“creative” (and resourceful!) in cutting out the woodwork when heat was installed, and consequently there’s not much to restore near the heating vents. And when my woodworker uncle came to visit a few months back and checked out our front door—nicely stripped—he noted that it had clearly been intended to be natural wood on the outside, which is apparently a quarter-sawn oak veneer, but not on the inside, which is plain old Doug fir. Ah well.) Luckily, we also own a HEPA vacuum, which is the best way to clear a home of dust and paint chips. I’m still undecided on the living room, where the paint is stripping pretty cleanly, the wood is in better shape (and was nicer to begin with—beautiful elm and quarter-sawn oak) and there might be some merit to finishing the project. It’s just that it’s a very, very BIG project—and we already have a lot of other big projects to contend with right now. On the other hand, I don’t want to repaint if we might really strip it all at some point, because that just creates more unnecessary work. We’ll see. This has some implications for our window project, too. The dust from our window troughs also tested high (not as high as the paint itself—but still high enough above the “safe” level to be of concern). Again, not terribly surprising, but something to think about nonetheless. One big source of lead dust in old houses is windows and doors opening and closing—and one good way to get rid of this problem is to replace the windows. So as we work through our window rehabbing and replacement work, we may decide to replace all of the bedroom windows instead of just the two with dry rot to ensure that none of the bedrooms have lead problems. If I can find a good place that will strip the windows, I may go that route as well. We may also re-prioritize to do these in order of use rather than in order of condition. A few of the windows have also had strips of unpainted wood set into the side jambs, which I think was intended to facilitate movement (or replace rotting wood perhaps), but has the added benefit of eliminating one of the two pieces of lead-coated wood that meet each time the windows open. Want to get your own lead test kit? If you live in Alameda County, you can check out the ACLPPP site for more information on ordering test kits or having someone come out to your home to do a free inspection. (These resources are geared towards homeowners, but there are programs for renters and landlords as well.) The cities of Oakland, Berkeley, Alameda, and Emeryville also have a variety of programs to pay for lead remediation and other work; information on those is also on the ACLPPP site. No, not that kind—this kind! These are all our new trees. I realized I haven’t been doing a good job documenting the garden progress this summer, so I snapped a bunch of these just so we’ll have a record of them as they (hopefully!) get bigger. Acacia tree---can't remember the variety anymore, but D. picked it out at the UC Botanical Garden's plant sale last year. 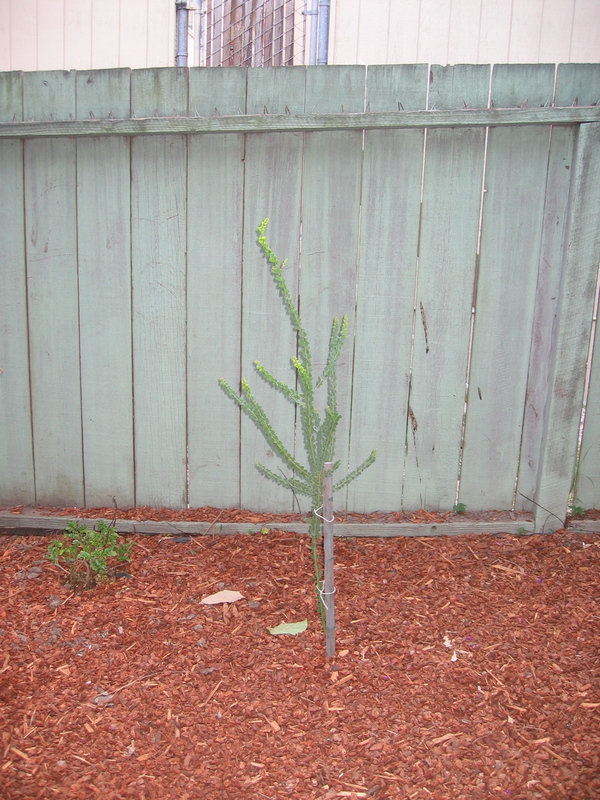 It's supposed to get quite big and fill this space in a lovely evergreen-with-yellow-flowers way without (supposedly) being too aggressive. Acacia honey is also supposed to be especially tasty, if we ever get around to getting bees. 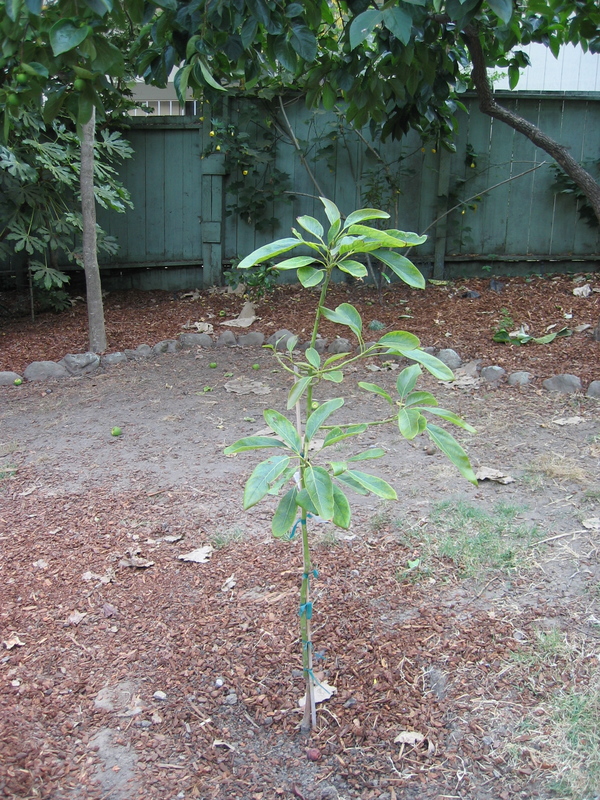 Multi-grafted pluot yearling: Dapple Dandy, Flavor Queen, and Flavor Supreme. This guy has looked healthier, but he did grow an insane amount this year, almost doubling in size. Yikes! We do need to do some aggressive pruning to balance out the tiniest graft, though, which didn't bear fruit at all this year. Montmorency sour cherry---the fencing is supposed to discourage the Labradane from trampling this one when he chases critters at night. Oroblanco grapefruit. All the citrus are a bit yellow this time of year; hopefully a little more to drink and a splash of iron sulfate will fix this soon. 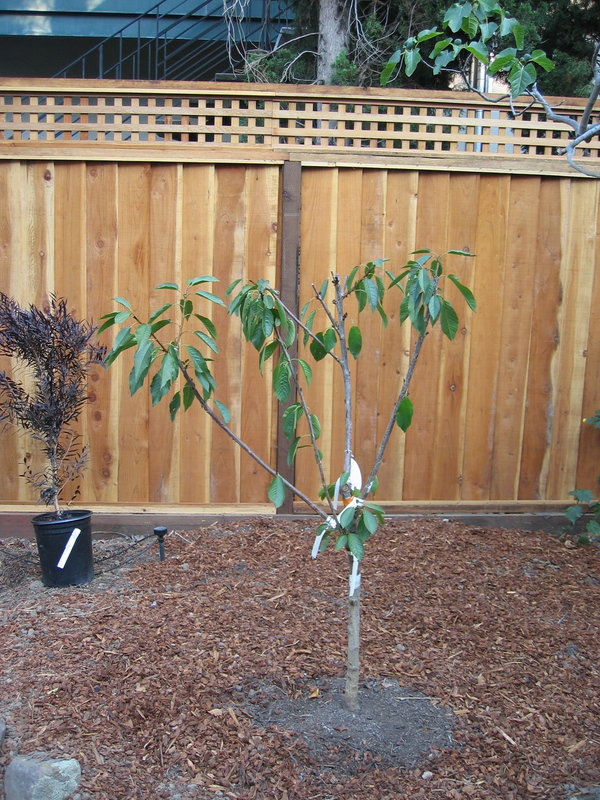 Multi-grafted cherry: Van, Bing, Lapins, and Rainier on Mazzard rootstock, so this one should get pretty big too. 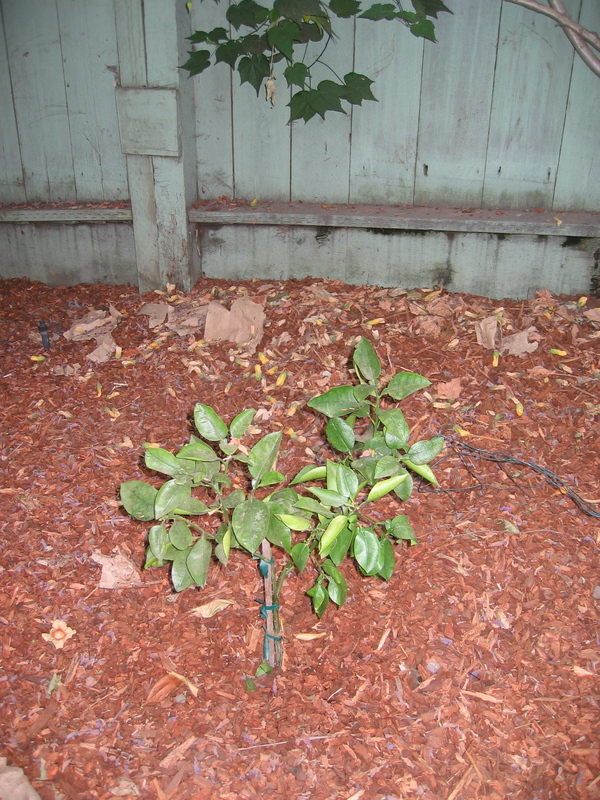 This went in where we pulled out a decrepit fig earlier this summer. Not pictured: The second Meyer lemon tree; the feijoa tree, which we’re pretty sure is now growing exclusively from below the graft, and will probably be replacing as a result; and our Charlie Brown Christmas tree, which is actually looking quite respectable these days and is growing happily in a shady corner of the yard, where it’s supposed to get to be 25 feet tall or so and provide some nice screening. We’ll see! We’re pretty close to being maxed out on space for trees in the yard at this point. 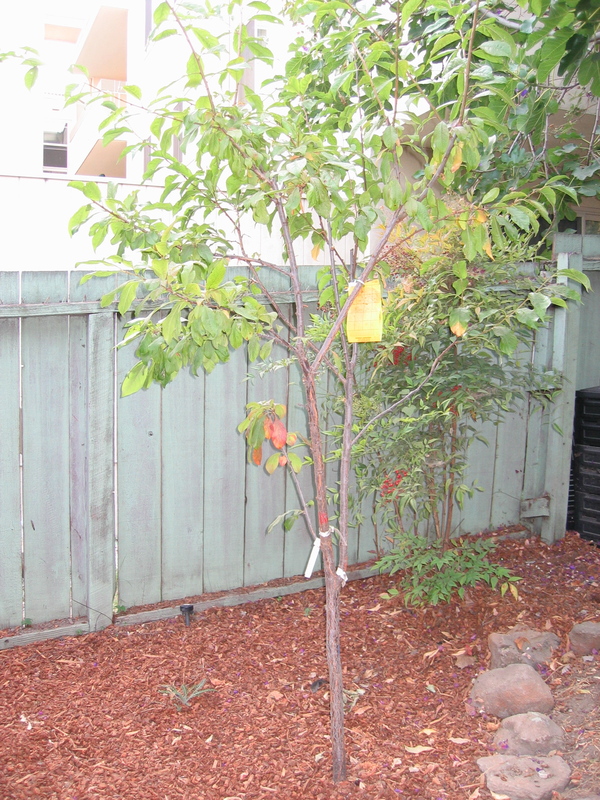 I have a few spaces targeted for large evergreen screen trees—one for a weeping bottlebrush tree, I think, and the other possibly for a type B avocado, plus the “Jervis Bay After Dark” peppermint tree D. picked out that’s visible behind the multi-grafted cherry, which we’ll plant as soon as the ground is diggable again. But that’s about it for the rear yard. Since D. wants a pear and I still want a fall-bearing apple (our Gala tree ripens in early July, which throws me for a loop, since I grew up in New England, where October is apple season! 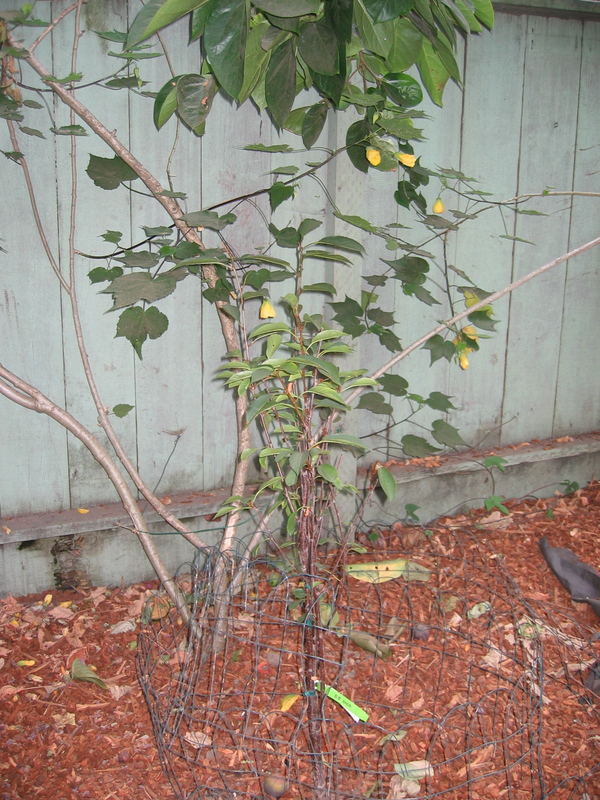 ), I’m thinking of pulling out some of the nandina in the side yard and planting one or both there. 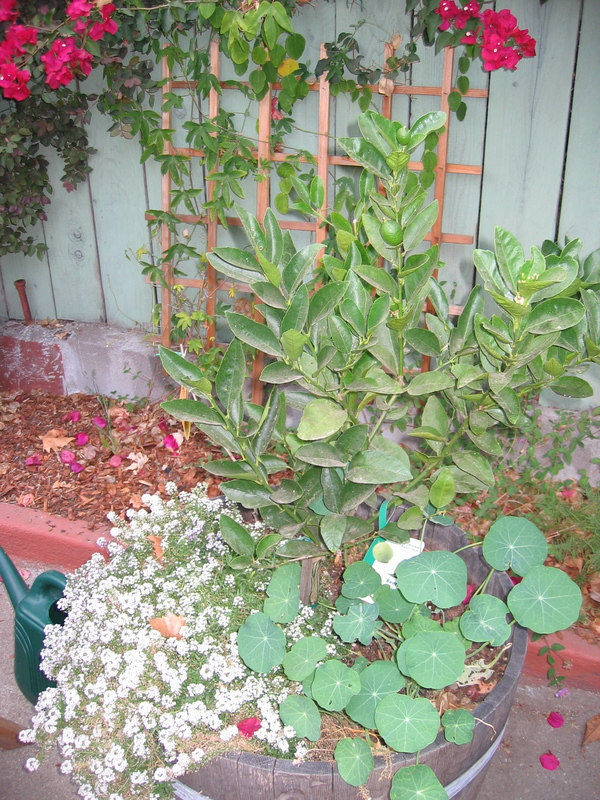 (Originally I wanted a Mutsu apple, but since they apparently don’t do too well in the mild Bay Area, I’m now leaning towards an heirloom Gravenstein, which ripens in late August or early September here. They’re unusual in that they need a cross-pollinator, but I think the Gala tree should do the trick.) We can also potentially put some espaliered trees along our rear fence, but then we’re pretty much done on the tree front. On to currants, more blueberries, elderberries, and other bushes this winter! ….what does that say about bad fences? However, the fence is DONE, which is a very, very exciting thing! We still have a few decisions to make. For starters, we share the fence on that side with two different parcels; the new fence was just for the section that borders the apartment building behind us, where the old retaining wall was collapsing. We still have two panels of fence that seem pretty stable, though they also drop down significantly into our other neighbors’ backyard. To complicate matters, they have a second fence and a shed behind ours, so replacing it is likely to be complex and costly. Initially I thought maybe we could have the guys who did this fence take off the boards of the other fence and match them, but now I’m iffy on that plan. Alternatively, we can just put a lattice top on it to make it look vaguely similar—but then there’s the weird redwood-green color conflict. 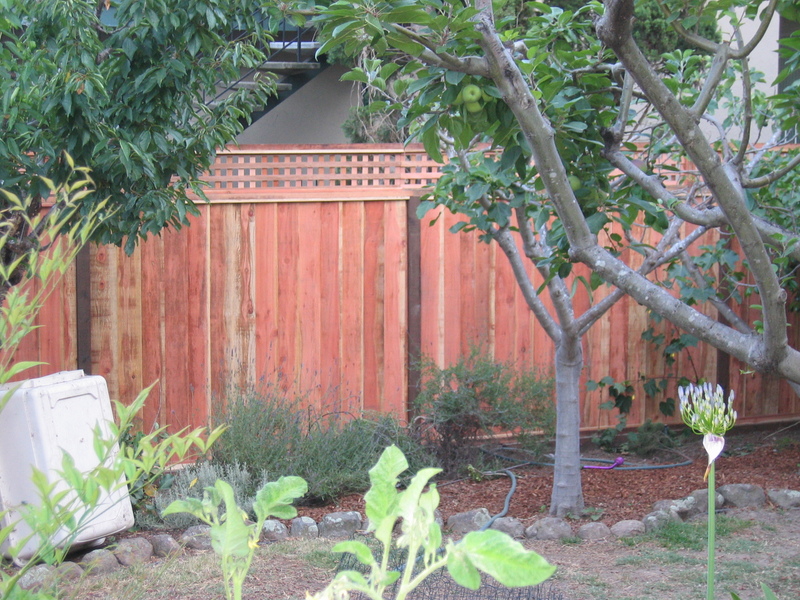 You can see the height difference pretty clearly in this photo—the old fence was around four-and-a-half feet tall, while the new one is theoretically six plus the lattice (I haven’t actually measured it). It would be nice for them to look a bit more consistent, but maybe not $2K nice. 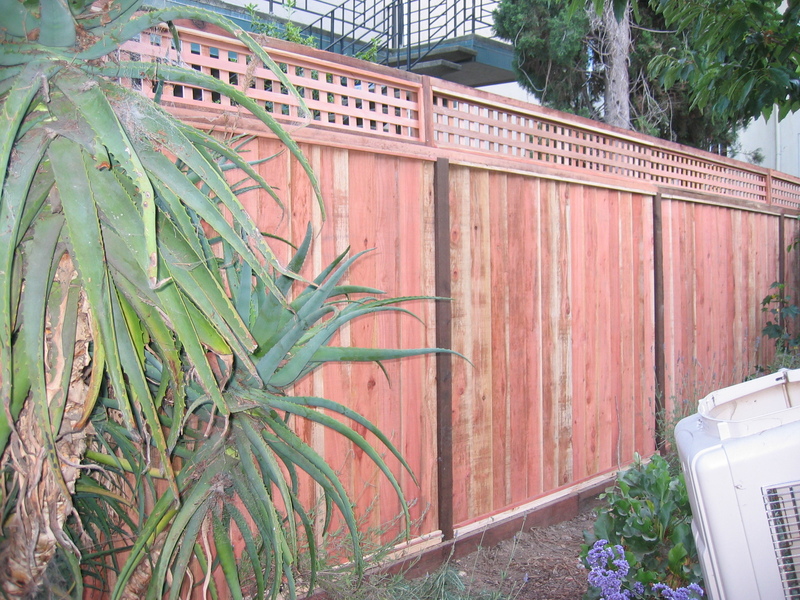 My current thought is that maybe we should just mount a large redwood trellis to the green fence, grow some vines, and be done with it. The other factor is that the space in front of the green fence is slated for some bamboo, since that’s the view out of our bedroom window where we pretty much look right into the glaring security lights of the apartment building behind us. So maybe it doesn’t really matter what the fence looks like behind the bamboo, as long as it’s functional. Anyway. The good news is that this project is now officially off the list, which means we’re done with all of the big ticket items that were on the to-do list when we moved in (rewiring, earthquake retrofit, and retaining wall) and can finally start saving up for the kitchen—woohoo! So, I’ve been pretty lazy about posting anything about our garden over the past couple of months, but it’s going gangbusters at this point. 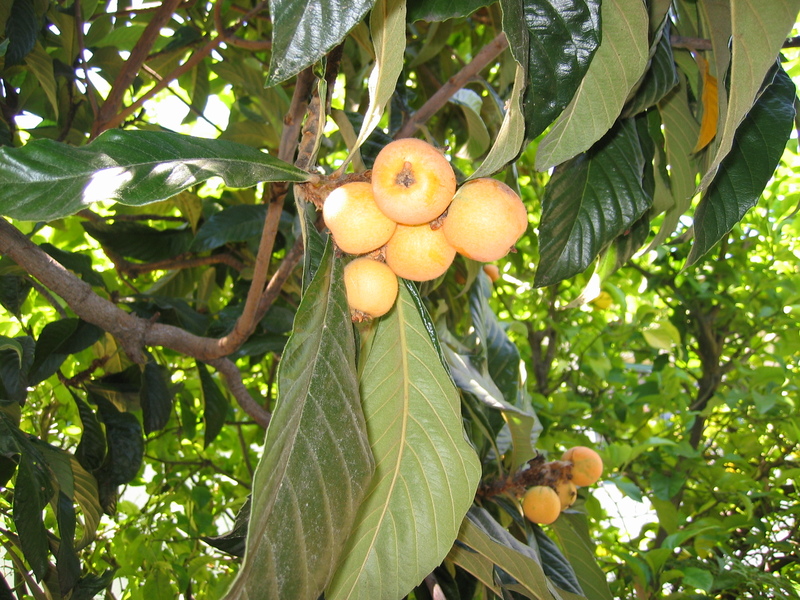 Ripe loquats, strawberries, and cherries: Not enough cherries to do much but snack on them, but this year we made some loquat jam (since I’m still at a loss as to what one is supposed to do with loquats, beyond just eating them fresh….last year we made loquat-infused vodka). The rest of the spring fruit is also well on its way to ripeness, so we’re excited to have Santa Rosa plums, blueberries, and several varieties of pluots later this month. Tomatoes, tomatoes, tomatoes! We planted several different kinds this year since last year’s plants did so abysmally—the idea was to experiment with different types and locations in the yard. So far, though, all of them seem to be flowering and setting fruit like crazy, so we may be drowning in tomatoes soon! A mystery cherry tomato variety from a Forage Oakland gathering. All but the cherry tomato and the Taxi plant came from Kassenhoff Growers, an Oakland-based grower that sells at both of our local farmer’s markets. We had good luck with a couple of their plants last year, so this year pretty much the entire garden (or at least what I didn’t grow from seed) came from there. 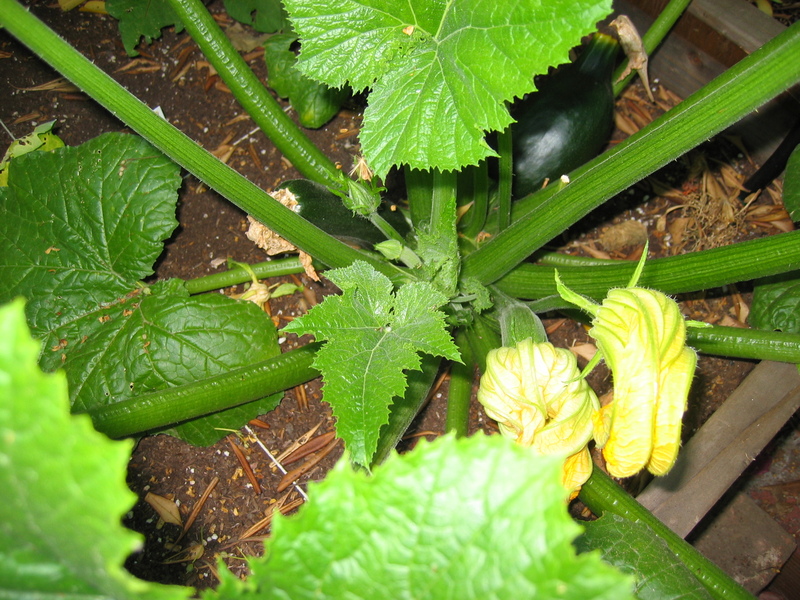 Squash, cucumbers, and eggplant. 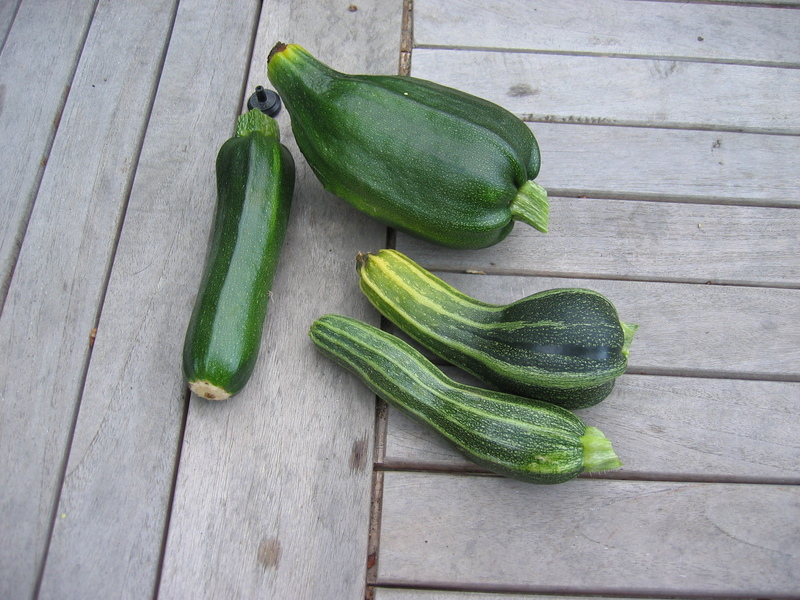 We’ve also got both summer and winter squash going strong. 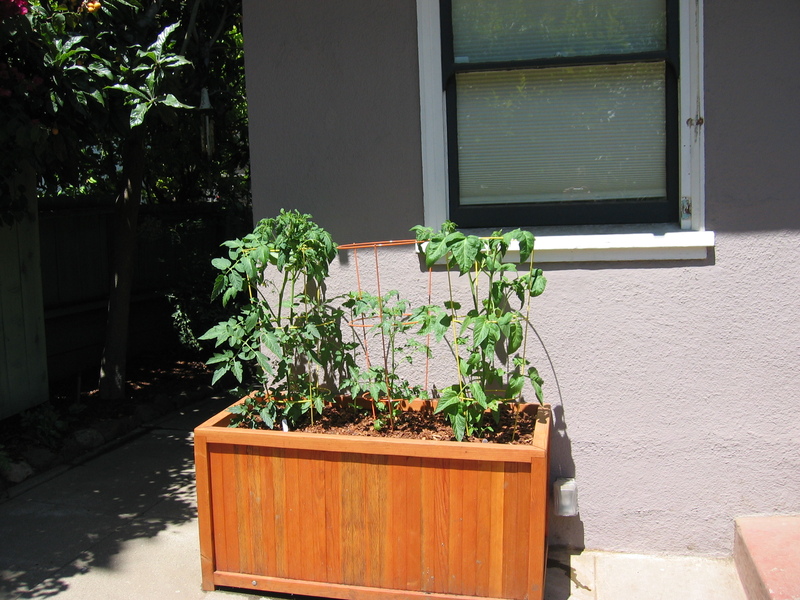 The only issue they’ve had this year has been that they’re easily double the size of last year’s plants, and are taking over their 18″ x 18″ garden squares and overshadowing the eggplant, which just can’t seem to get enough sun to grow. Next year I need to come up with a better plan for that. Asparagus! This little guy is one of two asparagus plants that a friend gave us last fall; I thought they’d died since they vanished for several months, but both have suddenly started sending up stalks and feathers. Asparagus takes a while, so we still have a few years before we can harvest it—but exciting nonetheless! Everything else is truckin’ along, looking pretty good so far this year. We harvested a few of last winter’s baby carrots today, and will eat the last of the peas for dinner since I had to pull the plants to put in some pickling cucumbers this morning. The basil seedlings finally got big enough to transplant, so they’re settling into the herb garden too. The first powdery mildew of the season showed up on one of the squash plants this week, though, and the whiteflies are multiplying in spite of our best efforts to keep them off the plants. So we’ll see how things go—but off to a good start. You are currently browsing the archives for the The Garden category.